You are browsing the Blog for deep fry. 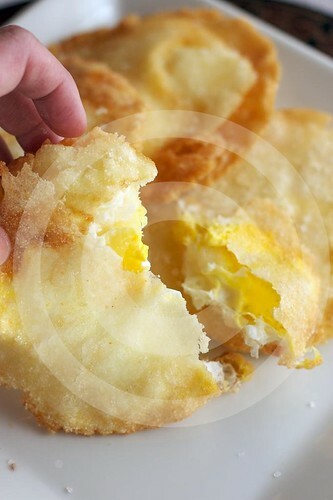 Arepa de huevo is a Colombian food that I remember from my childhood. 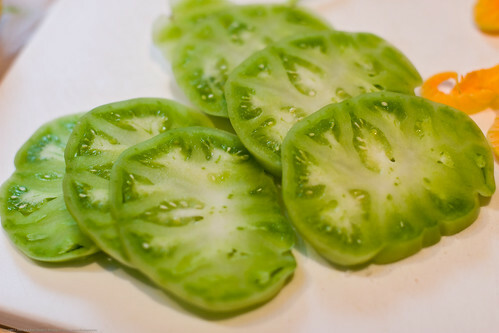 Other countries may do this but I do not know much or really anything about other varieties. 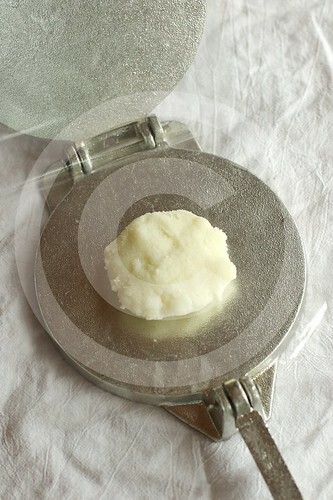 Arepas are made from a very finely ground corn meal. 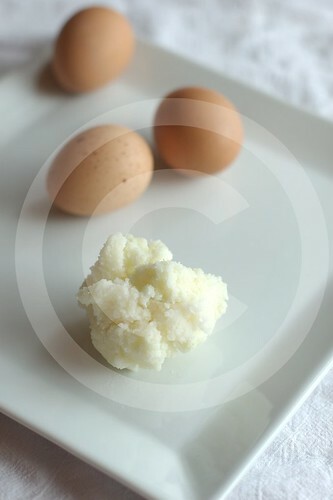 I will put a recipe or guideline below for making that as well as how-to photos on how to make the arepa with egg below. My first experience with it was when we visited Colombia 25 years ago. As in other latin american countries, street vendors sell all manner of things. We were on foot somewhere in Bogota, Colombia, and literally by the roadside there was this large woman sitting next to an enormous wok-like pot filled with boiling hot oil. She also had dozens of eggs and arepas. I didn’t really know what to expect when we walked up. 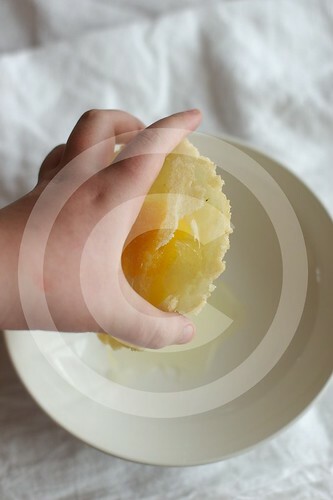 I watched her cut open a large arepa (size of your hand, I am used to seeing them more like 1/2 that size), break an egg into the steaming middle of the arepa, pinch it back closed, and slip it quickly down the side of the wok-pot down into the boiling oil. Next thing I know, I am holding a napkin with a steaming hot arepa de huevo inside, tasting it for the first time. I have always respected the potent possibilities of food poisoning and GI upset that can happen when you eat things in a region where you have not acclimated yourself to the local bugs in the water. On this trip, I experienced food poisoning also for the first time but it was NOT from the Arepa de huevo I had from the street vendor. Because this treat is deep fried, making it less likely to be a vector for forborne illnesses. More important than all of that, it is very delicious! I had not eaten one in all that time until just the other day, when I finally got down to making them in my own kitchen. They came out so much better than I had anticipated. I hope you will try them too! Saute the listed “hogao” ingredients in the olive oil until wilted, set aside. Mix the harina and salt and then add the boiling water. 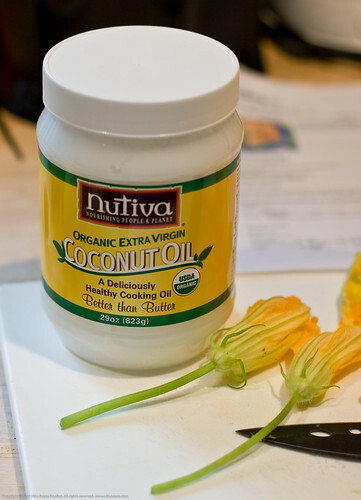 Mix until incorporated and set aside for 15 minutes. 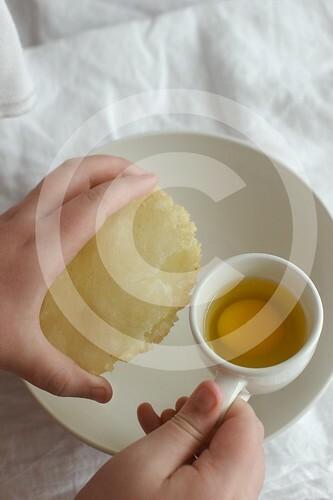 Wet hands with cold water and shape hand sized pancakes of harina (about 1/6 inch thick) or use a tortilla press. 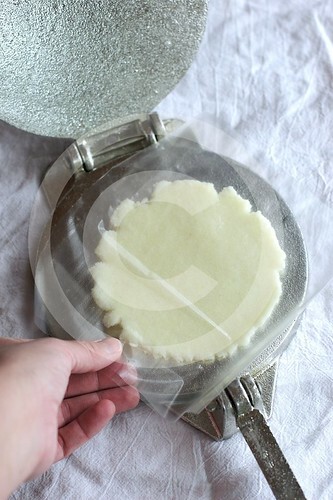 I used the press in this case but I think I would prefer to recommend the hand method as you get a thicker arepa. 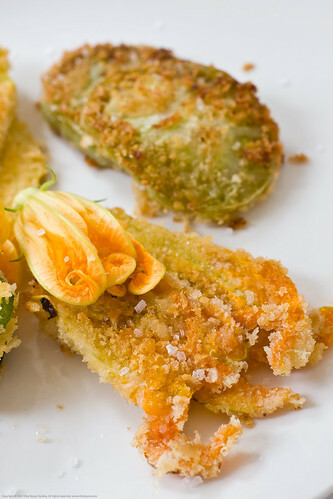 With the press, its a delicious crispy thing, just a bit different than I remember. 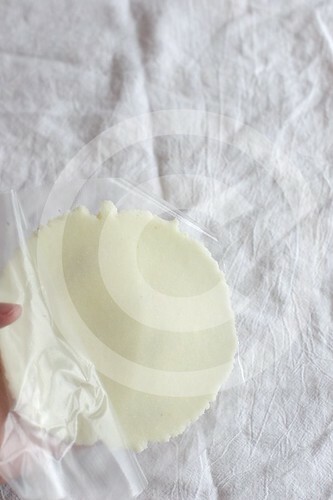 Put a ball of masa on the press (which you have lined with a freezer ziplock bag, cut to size). Gently push down on the press so that you mash it flat but not TOO thin. Open the press and rotate the arepa 180 degrees and press just slightly more to try to even the thickness all around. Peel back the plastic and either toast in a hot pan like you do with most arepas (below shown with smaller ones), or slip the raw arepa into the hot oil until it puffs up. 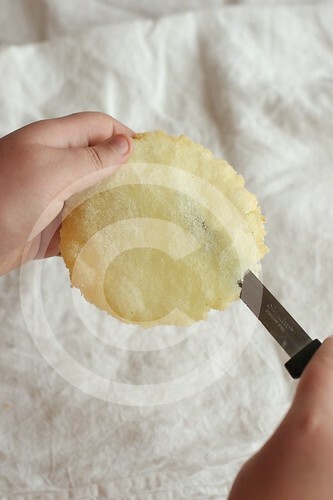 Carefully cut into the side of the arepa to form a pocket. Put a spoonful of hogao in the bottom of the fried arepa. 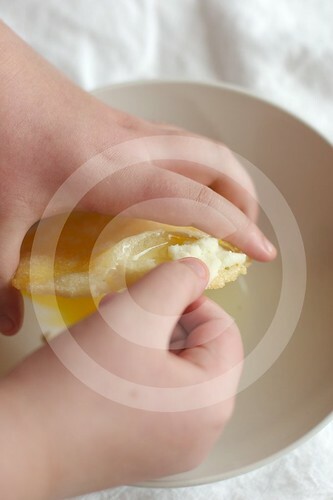 Put an egg into a small cup and then slip the egg into the pocket. Egg in the arepa, quick go to the next step! Mend the edge with raw dough and then slip it back into the hot oil for a couple of minutes (until it hits the color you want, light golden brown). What is a [tag]Mantis Shrimp[/tag]? Well, you are looking at three of them in the photo above. I was walking through the IBSS and came across some [tag]Southeast Asian[/tag] [tag]seafood[/tag] purveyors who had some interesting displays, this one included. 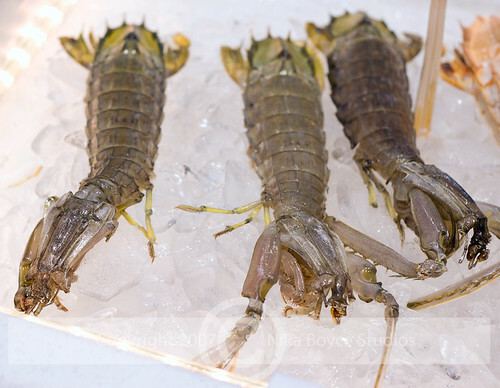 These [tag]animal[/tag]s are much larger than most shrimp, you would likely need two hands to hold one of them. They tend to be about 30 cm (11.8 inches) in length but have been known to grow to 38 cm (15 inches). While they are referred to as shrimp and are in the crustacea subphylum, they are not actually shrimp at all. Their name comes from the fact that they look like a cross between a [tag]praying mantis[/tag] ([tag]terrestrial[/tag]) and a shrimp. They are also much more intelligent and fierce than your average shrimp. Their odd looking [tag]appendage[/tag]s in the front are not just funky eye candy. 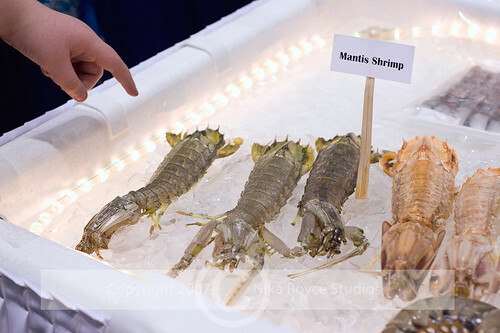 No, the [tag]mantis[/tag] [tag]shrimp[/tag] can use these claws to attack prey and predator (including fishermen’s fingers), with great force. Pet mantis shrimp are so tough they can even break through the double glass walls of an [tag]aquarium[/tag]. Yikes, this guy is not going to be added to any aquarium I have! Ok, one more neat fact and then I will get on the the meat of the matter. These mantis shrimp are not only wily and throw their back into their battles, they are able to create balls of fire in their [tag]claw[/tag]s. Remember I said they can break an aquarium wall? Well, with those fierce claws, they can flick them out to attack their prey or tormentor. When the claw is flicked out, a “[tag]cavitation bubble[/tag]” forms (a void that is left behind by the rapid displacement of the claw). Things on this micro-scale (and nano-scale) are non-intuitive for us. We would not expect that this cavitation bubble would flash with light, heat as hot as the surface of the sun, and pop to produce sonic wavefronts that travel away from the mantis shrimp at high speeds (called [tag]sonoluminescence[/tag]). For far more information on this and other aspects of Mantis Shrimp visit “Shrimp spring into shattering action” by [tag]April Holladay[/tag], a science journalist for USATODAY.com. I have borrowed a few resource links from her excellent article and put them at the bottom of this post. Good eating, if you can get a hold of it that is. They taste less like shrimp and more like [tag]lobster[/tag]. 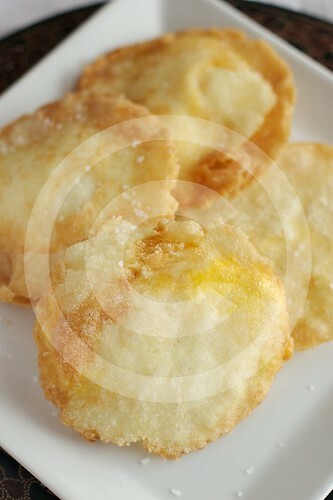 The Japanese call it “shako” and eat it raw and [tag]tempura[/tag] fried. The Italians eat it as a stewed dish called Ã¢â‚¬Å“canocie in busaraÃ¢â‚¬Â (stewed mantis shrimp) (found in “Cofanetto cucina del Bel Paese“). The Chinese eat them a million different ways, to be sure. You can visit one off-the-beaten path restaurant in Hong Kong to get your Mantis Shrimp fix, fried, combined with pepper and its own roe. The Spanish call them “[tag]galera[/tag]” and boil them in salt water. They probably serve them as a tapas in some seaside locations. I hope you have learned something interesting about these odd creatures. I sure have. I am not sure I will be eating them any time soon as they are rarely found in any market I go to and I hear they are quite [tag]expensive[/tag]. Have you eaten these? Where did you find them? How were they cooked? Did you like them? Share if you can. UC Berkeley News: Mantis shrimp may have swiftest kick in the animal kingdom by Robert Sanders. The full five senses gluttony that is Mardi Gras or Fat Tuesday is celebrated in Poland and other eastern european countries on Fat Thursday (TÃ…â€šusty czwartek in Polish) (The last thursday before Ash Wednesday, the start of Lent). This is a Christian tradition (that has pagan roots, as so much of Christianity does) where all the perishable and decadent ingredients generally given up for Lent (such as sugar, butter, eggs, chocolate, etc) are used up in feasting that would tax even the most conditioned competitive eater. A relatively large population of Polish immigrants settled here in Central and slightly more Western Massachusetts back in the early part of the last century. Some towns such as Springfield, Greenfield, Chicopee, Deerfield, Ludlow, Ware, Warren, and Palmer (especially the Three Rivers part of Palmer) attracted and fostered identifiably ethnic Polish American populations. As with any situation where an ethnic group coaleses, food is one of the first manifestations and nexi of culture. For example, Three Rivers has a festival every year where you can get your pierogi fix (as well as other dishes of which I am less knowledgable with, I am a relative newbie to Polish food beyond the iconic dishes). Another obvious Polish identifier is that you can find freshly made PÃ„â€¦czki (Poonch-ki) up until either Fat Thursday or Fat Tuesday (depends on the store I guess) in our big chain grocery stores. I have usually steered clear of these because of their decadence (we are not a dessert eating family) but this year I grabbed a few and shot a couple to share here. A PÃ„â€¦czki is a deep-fried piece of dough shaped into a flattened sphere and filled with jam or other sweet filling. 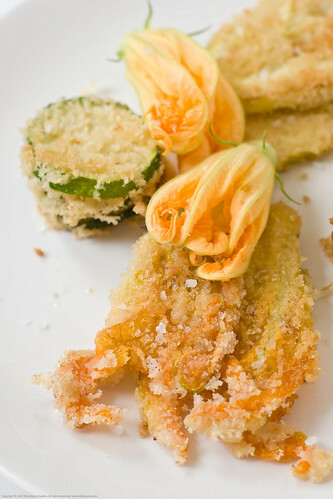 A traditional filling is marmalade made from fried rose buds. Fresh paczki are usually covered with powdered sugar, icing or bits of fried orange zest. Many countries and cultures share this treat (it tastes like the usual doughnut to me). Polish Jews called them pontshkes (Yiddish: Ã—Â¤Ã–Â¼Ã—ÂÃ–Â¸Ã—Â Ã—ËœÃ—Â©Ã—Â§Ã—Â¢Ã—Â¡) and ate them at Hanukkah. They are now known by the Modern Hebrew name, Ã—Â¡Ã—â€¢Ã—Â¤Ã—â€™Ã—Â Ã—â„¢Ã—â€¢Ã—Âª, sufganiyot (singular: Ã—Â¡Ã—â€¢Ã—Â¤Ã—â€™Ã—Â Ã—â„¢Ã—â€, sufganiyah). In St. Petersburg Russia they are called pyshki and ponchiki (ÃÂ¿ÃÂ¾ÃÂ½Ã‘â€¡ÃÂ¸ÃÂºÃÂ¸) in the rest of Russia. In Ukranian, they are called pampushky (ÃÂ¿ÃÂ°ÃÂ¼ÃÂ¿Ã‘Æ’Ã‘Ë†ÃÂºÃÂ¸) and in Lithuanian they are known as spurgos. Laissez les Bon Temps Rouler Yall!